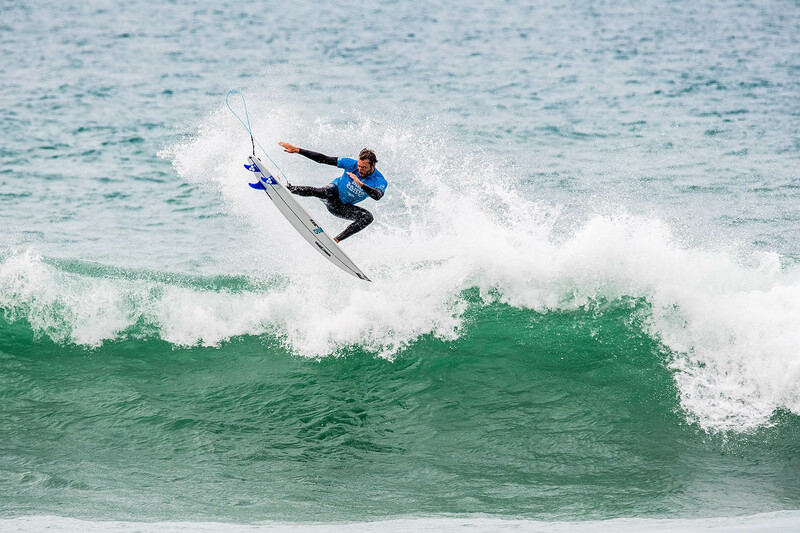 Frederico Morais (PRT) has won the QS3,000 Pro Santa Cruz pres. by Noah Surf House today in historic fashion, claiming victory in the Final bout against Ramzi Boukhiam (MAR) held in playful three-to-four foot surf at praia do mirante. Stop No. 3 of 12 on the 2019 World Surf League (WSL) European Qualifying Series (QS), the Pro Santa Cruz pres. by Noah Surf House, negotiated a tricky forecast with plenty of swell to culminate in great conditions. The former Championship Tour athlete Morais claims his career’s second QS win, after winning the Martinique Surf Pro in 2016 before he went on to qualify for the elite CT. The powerful regular foot came out on top of a stacked field on finals day and built momentum to peak at the right time in the Final against Boukhiam. The precious 3,000 ranking points collected in Santa Cruz today will kickstart Morais’ effort to re-claim his spot with the Top34 next season, and he’ll have another chance to bank important points on home soil again next week in Caparica. Boukhiam started early in the Final with a medium score for two turns but it was the local hero Morais who found the best wave early on, a long right that kept serving up sections for the regular foot to unload his signature carves on for a 7.00 and the lead. The Moroccan answered with a three-turn combo on a smaller wave and was rewarded with a 5.67, enough to take back the lead but nowhere near what he needed to put pressure on Morais. Ramzi Boukhiam (MAR) did try everything until the final seconds of the Final, but requiring a very high score, the pressure got to him and the Moroccan fell on his next few attempts. Boukhiam went one better on his Semifinal equal third result of 2018 and is poised to take out the Portuguese event in years to come. Earlier in the Semis as the focus switched back to the rights out the back, Boukhiam fired away with a ferocious attack on his backhand to post a 7.67 on his second wave. The Moroccan managed to fit two radical turns in the tightest of sections and looked as lethal as in the morning little left runners. His opponent Luel Felipe (BRA) struggled to find the right waves and fell on a few attempts, ultimately placing equal third, his best result since the Reef Pro Penascal in October of last year. The second Semi promised an incredible battle of two powerful regular footers, one just off the Championship Tour Morais and the other knocking on the door of the CT for a couple of years Jorgann Couzinet (FRA). Unfortunately conditions degraded a bit with strong cross shore winds and the tide bottoming out. After a very balanced first half of the heat with the lead exchanging hands a couple of times, Morais took control of the heat on the 10-minute mark with a 6.60 and Couzinet fell on his first maneuver next trying to answer. The following exchange went the Frenchman’s way but he was left chasing a mid 6 and placed equal third.